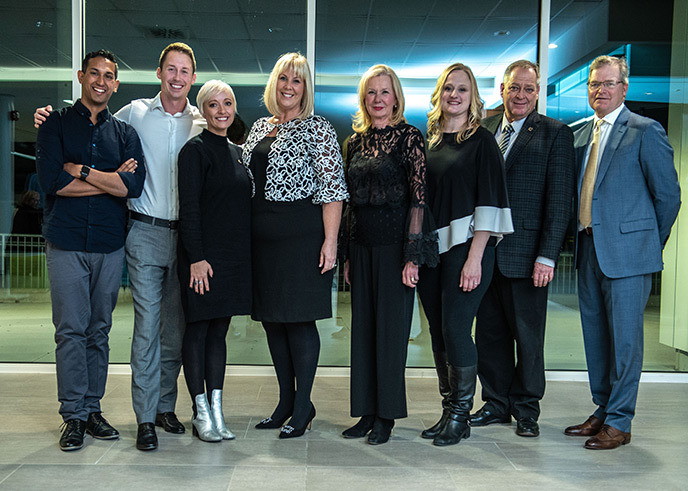 If you know Conestoga graduates who are making exceptional contributions to their businesses or the community, please consider nominating them for an award. For more information, contact the Alumni office. Conestoga has been recognizing outstanding graduates with Alumni of Distinction Awards since 1997. Chosen by a nomination process, recipients demonstrate professional success, achieve public recognition or contribute to their industry or community. All Conestoga graduates are eligible to be nominated for an Alumni of Distinction Award. The Premier’s Awards recognizes the tremendous contribution that Ontario’s college graduates make to the success of the province and beyond. The awards were established in 1992 to mark the 25th anniversary of Ontario’s colleges. Presented annually, the Premier's Awards recognize graduates in the following seven categories: Apprentinceship, Business, Community Services, Creative Arts and Design, Health Sciences, Recent Graduate, and Technology. Visit www.co-awards.org to learn more. Don Gosen is a 1974 Air & Water Resources Technology grad and completed his Electrician – Construction & Maintenance Apprenticeship in 1980. Gosen is the former president of Gosen Electric Limited. He owned and operated the company for 38 years since taking over from his father in 1977. Currently, Gosen is the Chair of the Board of Governors for the Ontario College of Trades and a part-time faculty member in Conestoga’s Electrician program. Gosen was recognized as an Alumnus of Distinction in 2009. Learn more about Don Gosen. Steve Zinger is a 2006 graduate of the Business Administration – Marketing program and President of Blendtek. Zinger jumped into the family business when he was 12 and did just about every job possible. He launched his own business, Blendtek, within the organization after completing his post-secondary education. Blendtek Fine Ingredients is focused on developing innovative new technologies, food systems and ingredients to address the need to feed a growing world population. It was named Business of the Year for companies with one to 49 employees at the Cambridge Chamber of Commerce business Excellence awards. In addition to Business of the Year, Zinger was also honoured with the Young Entrepreneur of the Year award. Learn more about Steve Zinger and Blendtek. Martha George is President of the Grand Valley Construction Association (GVCA), an advocate for the construction industry, and has been instrumental in developing mentoring programs to connect women and younger association members to the industry. A 1999 graduate of our Teacher/Trainer of Adults program, Martha serves the community through her leadership with the GVCA and involvement with various boards and associations, including multiple terms on Conestoga’s Board of Governors and Program Advisory Committees. George received the Queen’s Diamond Jubilee medal in 2012. Learn more about Martha George and the GVCA. Sherry Lickers is a 1984 graduate of the Early Childhood Education program and has spent the last 30 years working in the child care field, helping children and families. After initial positions in the cities of Cambridge and Brantford, Sherry returned to her Six Nations home to share her skills and knowledge. She currently serves as Director (Acting), Six Nations Child Care Services. Sherry supports her community through her roles as President of the Six Nations Skating Club and member of many other community agencies and groups. In her first book, Bounce Back: What Women Can Do When Life Hits Them Hard, she advises women on how to be strong, overcome hardships, meet their needs and be successful. Sherry was recognized as an Alumnus of Distinction in 2015. Learn more about Six Nations of the Grand River. Deanna Clatworthy is a 2012 Practical Nursing graduate, a registered practical nurse (RPN), public speaker and health educator. She is the Clinic Coordinator and Nurse at HIV/AIDS Resources and Community Health (ARCH Clinic) in Guelph, which cares for individuals who are living with or affected by HIV/AIDS. Transgender‑Health‑Services is a program offered at the ARCH Clinic and was developed and is led by Deanna. Deanna is passionate about teaching and presenting on topics regarding HIV/AIDS and is committed to reducing HIV stigma in health care and removing barriers to enhance and better support the health of transgender persons. Deanna has previous experience serving as a board member with other organizations and is honoured to be a part of the esteemed panel of nurses as she currently represents Region 2 on the Registered Practical Nursing Association of Ontario (RPNAO) Board of Directors. Casie Stewart is a 2003 Business Administration – Marketing graduate and 30‑something Canadian writer, director and entrepreneur. She's an award‑winning lifestyle blogger, content creator and expert in social and digital media. Documenting her life since 2005 via her blog ‘This is my Life,’ Casie’s been at the forefront of blogging and social media. Its growth in popularity has inspired brands to connect and partner with her to offer new and creative content for their audiences. Casie has crafted a highly respected and authentic online voice alongside her personal brand. During her decade‑long career in media, she has been named Canadian Screen Award Voice Pioneer, Best Travel Blog, and been a keynote speaker at SXSW, NXNE and TEDx. Casie is currently a director with weare1188 Films in Toronto and represented by the National Speakers Bureau of Canada. Learn more about Casie Stewart. Allie is a 2017 graduate from one of Conestoga’s newest programs, Community Integration through Cooperative Education (CICE). Allie, who’s been involved with the Special Olympics for seven years, qualified for Team Canada at the 2016 Special Olympics Canada Winter Games in Newfoundland. While still a student, Allie Libertini represented Team Canada at the 2017 Special Olympics World Winter Games in Austria. She returned home from Austria with two silver medals and a 5th place finish in Nordic skiing. Allie is a well-rounded athlete, regularly competing in triathlon and duathlon races with her family and friends. Since graduating last year, Allie has focused her athletic efforts on powerlifting and is currently competing for the chance to represent Canada at the Special Olympics World Summer Games in 2019. Learn more about Special Olympics Ontario.